The official Status of Forces Agreement, agreed to by the United States and Iraq in 2008, states, "All U.S. forces are to withdraw from all Iraqi territory, water and airspace no later than the 31st of December of 2011." Now, as the withdrawal deadline looms on the horizon, U.S. allegations of Iranian-sponsored Iraqi resistance to the eight-year occupation have resurfaced. In her latest IPS report, Barbara Slavin addresses the recent "chorus of U.S. officials [accusing] Iran of providing lethal weapons to Iraqi Shiite militias that have targeted U.S. soldiers and caused a spike in U.S. death tolls," noting that, "[s]imilar charges have been made against Iran in the past." These allegations are often reported verbatim in the mainstream press, as I noted last month in a post entitled "The Uncritical Stenography of Beltway Reportage". Slavin points out that both the former Defense Secretary Robert Gates and his recent replacement Leon Panetta, along with other officials, have repeated these accusations of late. Earlier this month, General Lloyd Austin told reporters that new weapons "are coming in from Iran, we're certain of that." Later the same day, The Washington Post reported that U.S. ambassador to Iraq James F. Jeffrey said that "fresh forensic testing on weapons used in the latest deadly attacks in the country bolsters assertions by U.S. officials that Iran is supporting Iraqi insurgents with new weapons and training." In an interview with the Post Jeffrey said, "We’re not talking about a smoking pistol. There is no doubt this is Iranian," adding, "We're seeing more lethal weapons, more accurate weapons, more longer-range weapons. And we're seeing more sophisticated mobile and other deployment options, and we're seeing better-trained people." During a Washington briefing on July 8, Admiral Mike Mullen, Chairman of the Joint Chiefs of Staff, stated, "Iran is very directly supporting extremist troops which are killing our troops." Responding directly to Mullen's statement, the Iranian ambassador to Iraq, Hassan Danaeifar, told Iranian press outlets, "These comments are repetitious and display the United States' trouble in earning the attention of the Iraqi parliament and government for extending its presence in Iraq," continuing, "These remarks are a lie and aim to put the blame on the other countries." "I believe the Americans are trying to make excuses, create Iranophobia, and cause doubt and anxiety among Iraqi officials and society. The Americans are trying to suggest that if they leave Iraq, Iraq will be threatened by Iran," he added. On Monday, The New York Times quoted Leon Panetta as saying, "We're seeing more of those weapons going in from Iran, and they've really hurt us." During his first trip to Iraq as Defense Secretary, Panetta told U.S. soldiers in Baghdad, "We are very concerned about Iran and the weapons they are providing to extremists here in Iraq." Slavin notes that he also "threatened Iran with unspecified retaliation if the attacks did not cease." Reuters quoted Panetta as stating that, in order to stem alleged flow of weapons, the U.S. military was prepared to "do what we have to do unilaterally, to be able to go after those threats as well, and we're doing that." Both The New York Times and Slavin note that, regarding the proof of the weapons' Iranian origin, "Panetta did not elaborate on what the forensic evidence entailed." Nevertheless, according to a report by Agence France Presse (AFP), the U.S. military's Task Force Troy, which is "doing the forensic work at the US military's Camp Victory near Baghdad airport", insist that there is "no doubt of Iran's signature." 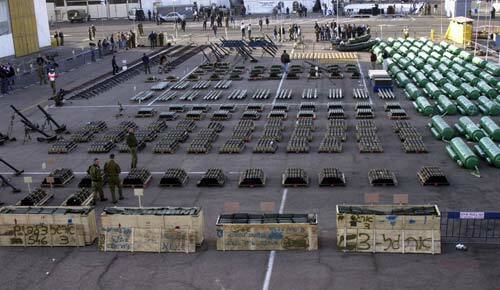 Back in 2008, when the Bush administration was again ramping up allegations of Iranian weapons in Iraq, similar studies conducted by Task Force Troy found that, of the thousands of weapons seized from Mahdi Army strongholds, none were of Iranian origin. The caches that included Iranian weapons thus represented just 2 percent of all caches found. That means Iranian-made weapons were a fraction of one percent of the total weapons found in Shi'a militia caches during that period. The extremely small proportion of Iranian arms in Shi'a militia weapons caches further suggests that Shi'a militia fighters in Iraq had been getting weapons from local and international arms markets rather than from an official Iranian-sponsored smuggling network. According to an Iranian Fars News Agency (FNA) report, also from Monday, a U.S. State Department official denied the existence of any substantive evidence whatsoever. Speaking with an FNA journalist on the sidelines of the opening of a new US consulate in the Northern Kurdish town of Erbil in Iraq, U.S. Deputy Secretary of State Thomas Nides was quoted as revealing that while "the US is well aware of Tehran's financial and military assistance with US foes in Iraq", it has absolutely no "tangible evidence" to back up this assertion. When Nides, whom the State Department describes as "Chief Operating Officer of the Department and as alter ego to Secretary Clinton", was asked by the FNA reporter how, without any hard proof, the U.S. can make such claims, his reported reply was truly Orwellian: "We are sure that Iran helps the militants, but our knowledge is based on information that cannot be presented or released." He continued, "That is to say, there is no proof since it is just intelligence." In response to this report, which gained traction in other Iranian and international media reports but garnered not a mention here in the U.S., the State Department released a categorical denial: "Deputy Secretary Nides did not speak to a Fars News Agency journalist while he was in Erbil, nor did he make any of the comments that were attributed to him in the article." Commenting further on the Iranian report via an email exchange with members of the Gulf/2000 Project, E. William Murad, Public Diplomacy Desk Officer in the State Department's Office of Iranian Affairs, noted the Department was "concerned by Fars News Agency's egregious lack of respect for recognized journalistic professionalism." "Never believe anything until it's officially denied." A request has been made to correspondants at Fars News to substantiate the claims made in their Thomas Nides article. This post will hopefully be updated with that information if I receive a reply.